According to a Google Rater Guidelines Document, helpful content is an indicator of a page’s quality (and as result, Google ranking). One of the major examples includes mortgage calculators. If you are the owner of a real estate agency or responsible for a dedicated real estate website, placing a widget with a mortgage calculator can not only improve the user experience but also improve the positions in the SERP. Your position in search results may become better. In this review, we will discuss the top 9 websites offering proficient HTML / js calculator widget that can be placed on your website for free. You can test each plugin on this page. Before proceeding to the review, let's discuss several criteria for determining the quality of the widget. Some of these measures are obvious, like the appearance of the user interface, some of them are not. 1. First impressions decide whether your user will keep coming back to you or choose to work with a more appealing mortgage calculator. A lasting impression is formed based on how attractive the widget looks. The appearance of the widget indeed holds the most significance. A good mortgage calculator widget allows you to customize the appearance so that the widget matches the design of your site. In this review of deciding the best mortgage calculator widget, we will post on our page all the decent widgets, and you can compare them yourself and choose the one that suits your website the best. 2. The usability of the widget and the user experience are equally imperative. You may want to add/remove additional fields like PMI, HOA, and extra payments. 4. Is your mortgage calculator widget mobile friendly? According to the researchers, mobile traffic has reached 63% of all traffic in the US. The widget code should be responsive. This basically means that it should appear well on a variety of devices or screen sizes Based on all the above-mentioned criteria, we will now review the most popular widgets of mortgage calculators found in Google. Based on all the above-mentioned criteria, we will now review the most popular widgets of mortgage calculators found in Google. This free mobile-friendly amortization calculator widget works well on desktops, tablets or phones. It adapts itself to your website’s layout and user device’s screen size. But it cannot be customized. There is no way to download amortization schedule. Also, it's synchronous downloading which means your site visitors will have to wait for the widget to load. Let's look at another popular site that offers a simple and free mortgage calculator script. The website allows you to customize the calculator and select different sizes, such as - 960x330, 700x330, 500x330. You can also change the background color. Mortgage amortization is shown by year. Unfortunately, there is no way to download the breakdown by months. This the most popular mortgage calculator script powered by mlcalc.com. It is also one of the most prevalent mortgage calculators because of its small size, full functionality and good appearances. It allows specifying property taxes, PMI and even insurance. 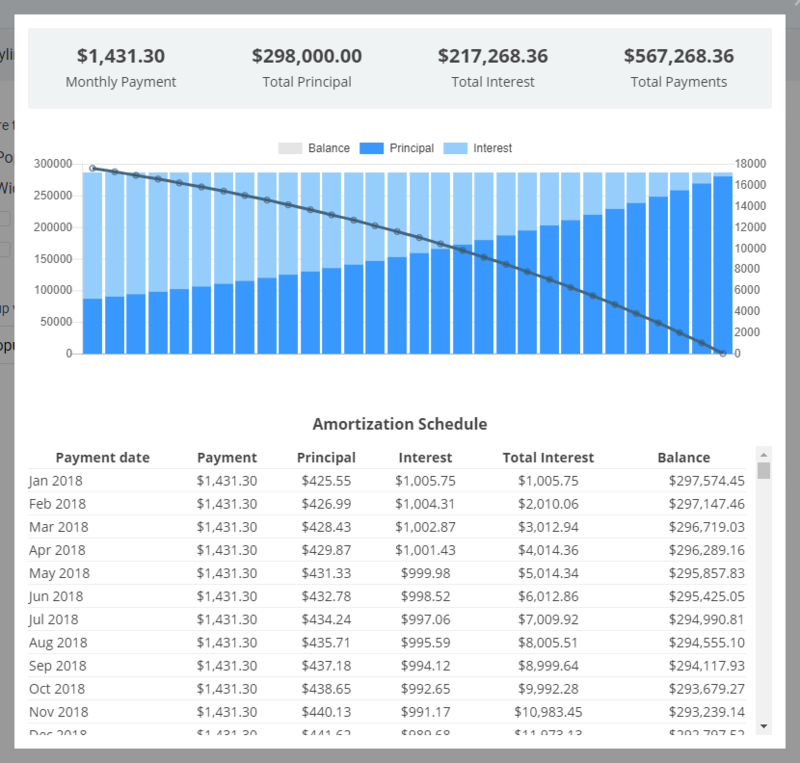 You can see the amortization schedule grouped by years, total monthly payment and payoff date. Also, this mortgage calculator widget allows you to specify the initial values of the loan. This can be a very useful feature if you want your widget to be pre-populated with known values. Amortization schedule is shown in the popup window, and the bad news at the bottom of the page is, it displays ads. You can check it yourself by pressing calculate button. The code of the mortgage calculator embeds the outdated version of Jquery into the page, which conflicts with the current version. Hence, it’s not an option to work with. A good feature of this widget is that it uses asynchronous loading and Akamai CDN (the leading content delivery network) to host the widget's code, which means that even if the widget's website does not work, your website will still run smoothly. This widget allows you to change the background color and locale. For example, you can choose not only US dollars, but also Brazilian reals. It features a full cost/payment breakdown, interactive charts and both monthly and yearly amortization schedules. The widget is fully responsive, compatible with all modern browsers and will work on any website. The bad news is that most of the widgets are paid, the price starts at $ 50 per year. That’s a high amount to pay! On this page, I will place the free version of the widget. The mortgage calculator opens in the new popup window. The very first search result in Google on the "mortgage calculator widget ". This is one of the oldest and most popular sites for calculating mortgage payments. This website offers two different widgets. The first widget is based on the iframe. As you can see, when you press the "Calculate" button, you are redirected to the calculator page. Before you post this widget on your page, answer the question - do you really want your clients to be redirected to another page? No, right? The second widget is a fully working JS widget that can be placed on the page of your site. When I press calculate button, the text goes outside the widget and cannot be read. None of the widgets can be configured. Both widgets use synchronous loading, and the user interface of the widgets cannot be changed. Let's see if we can find a better candidate. It is free and there are no ads. Hosted on the CDN network, therefore no downtime. Trusted by over 500 websites. Fully responsive, compatible with all modern browsers. This widget allows you to change the type of popup which appears when a user presses the calculate button. You can choose between the PIE chart or the BAR chart. You can turn off the appearance of a pop-up window at all. In this case calculation results (monthly payment and total interest) will be shown in below calculate button. You can change appearance of the widget - background color, borders, font. There are 4 built-in themes. You can add additional fields like PMI, HOA and even extra-payment. You can grap the code of this widget here. This mortgage calculator widget is a free 3-in-1 calculator. It also includes mortgage affordability calculator which allows you to calculate a purchase price based on a set monthly cost. If you are looking for a small sized mortgage calculator widget, this can be a good choice. It also opens a detailed report in a different tab which includes taxes, HOA and insurance. There is an ability to dynamically pass the home loan amount, interest rate and loan to automatically set calculation defaults. This is very useful if you want to set default values when opening a page. Most widgets do not have this capability. 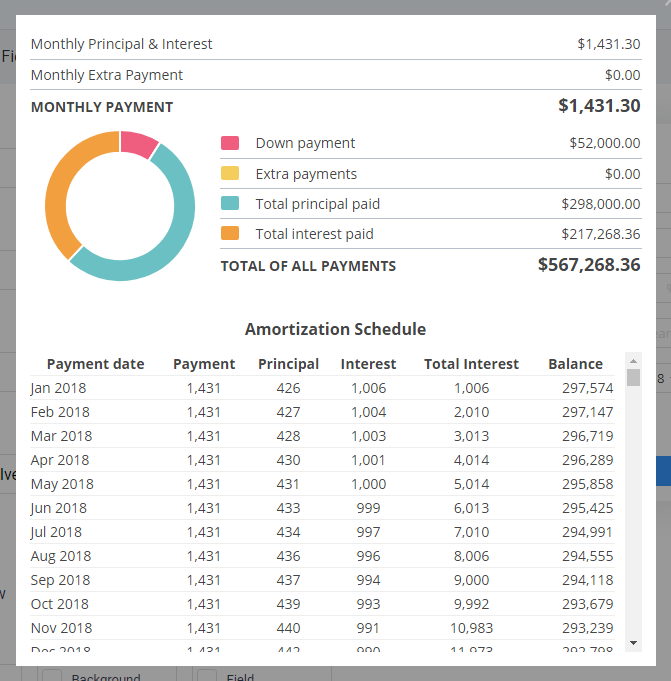 When you click on the print button, an amortization schedule opens in a new window ready for printing. It will be responsive and mobile-friendly. No ads, but still completely free. It will not include in your outdated version of third-party libraries that break your page. It will work on your page even if our website is not responding for some reason. It will not block content loading on your page. It will be highly customizable, including fonts, background colors, additional fields like PMI. The widget's code will be hosted on best content delivery network. Get in touch with us if you are interested in receiving such a mortgage calculator widget.